One of my role models, Auntie Mame, famously said “Life is a banquet and most poor suckers are starving to death. Live!” Which corresponds to my word for the year, Celebrate, as is celebrate all the fabulous things in life, big and small. 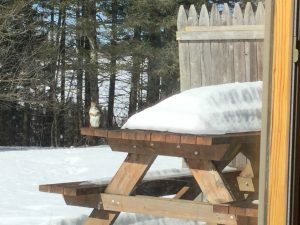 We’ll start with the very fat squirrel outside my window – I think we’ve been dumping too many stale crackers into the snow. We’re firm believers that squirrels need love just as much as birds do, so we have lots of both flocking around. And then there’s this: I get to spend my working days thinking of young women for Tom Hiddleston to sleep with – as if he needs any help. Does the that make me a pimp? Naaah. And I share the wealth – I’ve created women for Alan Rickman, Adam Driver, Rafe Fiennes, Howl (from Howl’s Moving Castle, Daniel Day-Lewis, and a so many others. It’s just Tom is the hero-avatar du jour. I hope he appreciates my efforts. So let’s see – we have nature, we have pretty men. What other treats do we need? Oh, food! 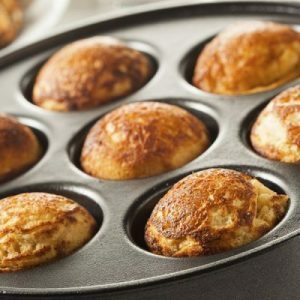 I’m on my 401st day straight of studying Danish (checking out my roots) and in the course of things I learned to make æbleskiver. Recipe upon request, and you don’t need the special pan – apparently you can just use a muffin pan. I was going to have something incredibly beautiful but we already have Hiddles, then I thought about puppy-cute but we already have Hiddles. Reminds me of a Dennis Leary ad for MTV. Let me see if I can find it. But substitute Tom Hiddleston for Cindy Crawford. Yum. And last but certainly not least – the song for the day. Life is a banquet. Go out there and live! Oddly enough, the videos are showing up on one part of my computer but not in the preview. So in case you can’t find any of the videos, get the to Youtube and search for Hiddleston Ice Bucket, Aloe Blacc Wake me up and Denis Leary/Cindy Crawford, and I’ll learn how to embed by next week. Aha, the videos came through! Yippee! Hey Anne…first of all you’re the bomb-diggity! You were with me in my early teens, through college, into adulthood…Your writing has been part of my life for years. I just wanted you to know you had an impact. You put hours and days and I’m sure some of the time a lot of swearing into writing a book and then I finish it with in a day!! !…honestly I wish I could saviour them but they are all so good. I devour your writing like a glutton who has been starving for a year! Can’t wait for Heartless to come out. On another note: Can you hook me up with your recipe for æbleskiver? They look delicious and I’m always looking for interesting recipes. Anyway, just wanted you to know that your are appreciated (though I’m sure you already know that). And Hiddleston is standing in my dream garden on a mildly rainy day, my favorite weather.